Skyservice Airlines flight SSV960, an Airbus A320 aircraft, was departing from runway 23 at Toronto/Lester B. Pearson International Airport, on a domestic charter flight to Edmonton, Alberta. At 16:13 eastern daylight time, the take-off run was started and considered normal until the aircraft rotated. At this point, there was a loud bang and simultaneous shudder of the aircraft. The master caution chimed; however, no electronic centralized aircraft monitoring messages were displayed. 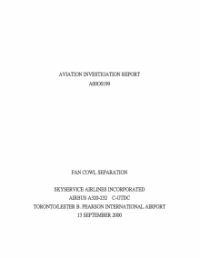 At 1500 feet above ground level, the electronic centralized aircraft monitoring began to display numerous faults related to the left engine (IAE V2500). The flight crew declared an emergency and made an immediate return to Toronto for an overweight landing on the runway from which they had just departed. During the landing roll, the captain navigated the aircraft around several pieces of debris on the runway, which were later identified as the fan cowlings of the left engine. After an inspection by emergency response services crew, the aircraft returned to the gate where the passengers deplaned normally. No one was injured. Prior to the accident the aircraft had received maintenance by the night shift maintenance crew. The work on C-GTDC included the changing of the right-hand nose wheel assembly, the replacement of a loaner automatic direction finder (ADF) antenna on the top of the aircraft, and the replacement of an oil-scavenge line on the left engine. From 05:00 to 05:30 the left engine was ground run with the fan cowlings open, to check for leaks, after which it was serviced with oil. An oil rag was then placed under the drain mast to catch any residual oil drips. AME1 and AME2 began to close and secure the fan cowlings, but were told by the acting crew chief to leave the latches unsecured. Since the end of the shift was approaching, the crew cleaned the area and returned to the maintenance facilities. The next shift crew were verbally briefed but the unlatched fan cowlings were not mentioned. C-GTDC was scheduled to be towed to the gate at 12:00 for a 16:00 departure. In preparation for the tow, two maintenance crew members did a walkaround check. During the walkaround check, the new crew chief picked up the rag under the left-engine drain mast and a piece of cardboard in the exhaust of the right engine. The aircraft was then towed to the gate. After lunch the crew chief and an aircraft maintenance engineer returned to the aircraft, and each conducted a separate walkaround check, with no findings. At 15:00 the flight crew arrived at the aircraft, was verbally briefed by the engineer, and began the preflight checks. The first officer carried out the pre-departure walkaround check and found no discrepancies. 1. The left-engine fan cowlings were closed, but the latches were intentionally not locked. This situation led to the aircraft departing with the fan cowls unlocked, resulting in damage to the aircraft. 2. Standard operating procedures and maintenance practices were not adhered to, leading CC2 and the captain to believe that the engine was secure. 3. The verbal handover during shift transfer was inadequate. Therefore, CC2 was not effectively made aware of the need to complete clamping the oil-scavenge line and secure the left-engine fan cowlings during his next shift. 4. During separate walkaround checks, CC2, AME4, and the first officer did not observe that the fan cowling latches were unlatched. 5. The positioning of the fan cowling caution placard is inadequate, in that it is not easily seen when the fan cowlings are closed and unlatched. Distance from Toronto-Pearson International Airport, ON to Edmonton International Airport, AB as the crow flies is 2670 km (1669 miles).